lots of posts about poor fps so i will share some basic settings to use . if someone else could do same for radeon users would be good. 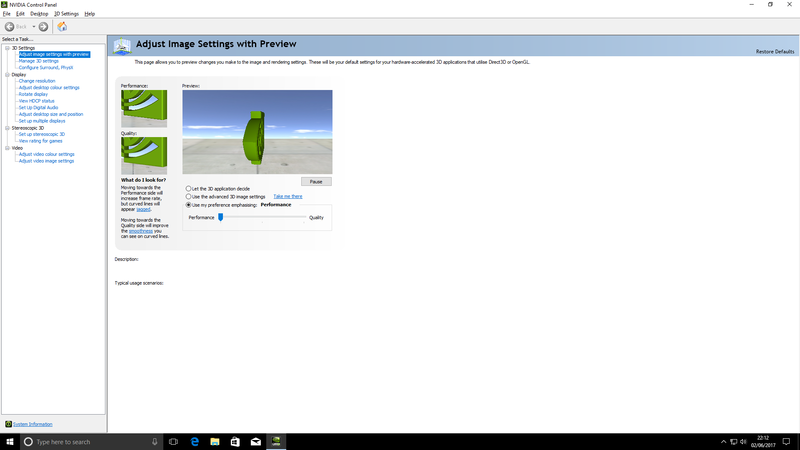 first off leave the 3d settings alone as u may reverse what you are trying to do . 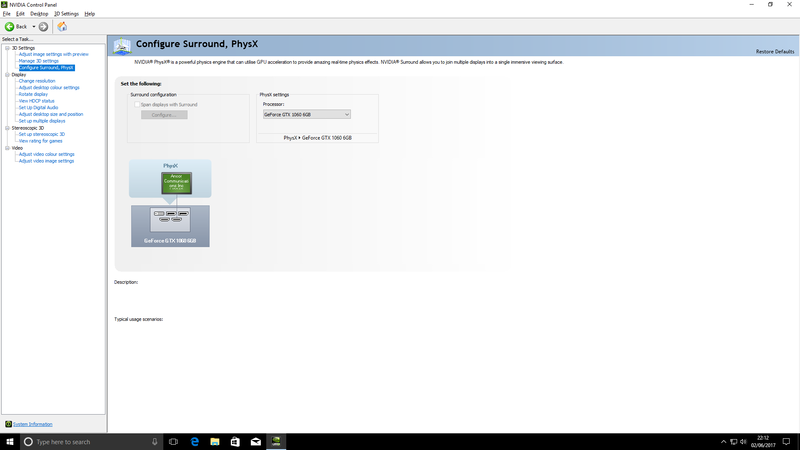 second is to set your physxs up to graphics card not cpu.and apply the setting. third set your preference for performance to performence mode and apply the setting. 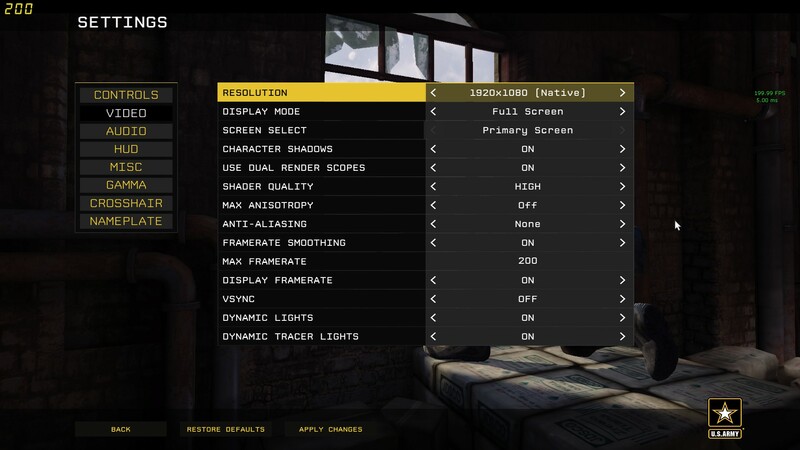 finally try these ingame settings .your screen setting should say native when u get it to your screen size. you can try low shader quality first. i hope this post helps some players. 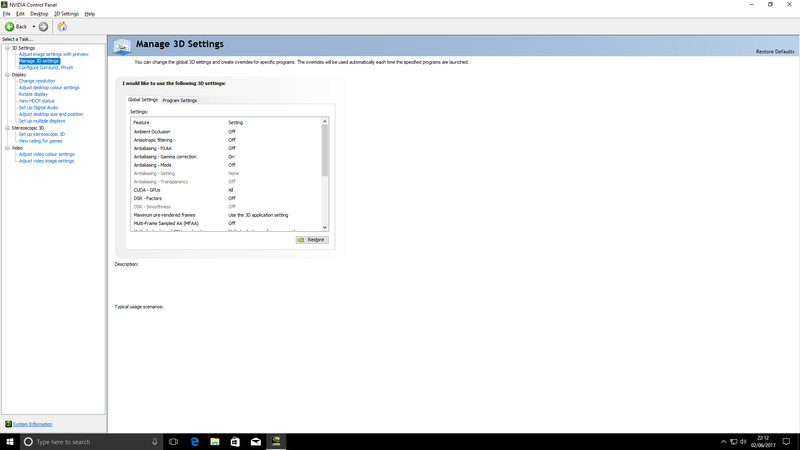 Great post bud, thank you I set my settings in the nvidia panel, just one thought, in the ingame settings, you show your fps set to 200, I was told it is better to set that value by 3's, like, 30, 60, 90, 120, 150, 180, so on.. I am not sure why, but that was a sugestion and I have mine set to 180 works good for me. It was actually by 30 and regarding some issue with weapon sounds. Doubt this is something that would improve performance. Not as in it will give you higher FPS(capping it will obviously not let you run outside of the cap), but it can/will give you a smoother experience as some visuals and sound will sync better. As a side note, if you plan to use recording software such as Shadowplay, I have found that a desync between the desktop refresh, in-game fps and Shadowplay record fps can cause really jerky recordings. Therefore, I set all of those to some setting that will divide well for the smoothest results. So, I might set my desktop to 120hz instead of 144, my Shadowplay to 30 or 60fps and try to stabilize my in-game to 60 fps or 120 fps. Obviously, this all depends on what your hardware and the maps will run at, but it definitely makes a difference. i set mine to 200 and let it run with whatever it can per map . i still use razer cortex to knock off a few apps and close windows update whilst gaming . . actually peaks some days to 201 fps or so the cortex program tells me lol. as for using shadow play i dont really see any difference in game fps. I have a little guide that I created on Steam, If you're having any issues with your frame rate or anything like that, be sure to check out the guide and I hope it helps! there is no need to change any ini file . really . unless you have ultra low spec pc you wont see much improvement at all.